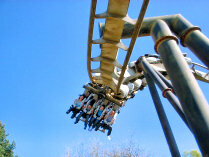 Adding to the list of events this year, Alton Towers are holding another Adrenaline Week in a couple of weeks' time. Running from Monday 4th to Friday 8th June, the event will not see any changes in terms of the park's appearance or ride line-up. However, there will be an offer running during the week - if you take your on-ride photo from any roller coaster in the park to Guest Services, they will exchange it for one park ticket for you to use during September. You won't be able to keep your ride photo, but effectively you'd be getting another park ticket for £4.99. Additionally, the park are running an offer to get your Adrenaline Week tickets for £20 (adults) or £16 (children). This event now puts the total number of Adrenaline Weeks in 2007 up to three, with one already held in March and another expected to round out the season in early November. Try joining the longest queue last - the queue will close, but everyone will get a ride.